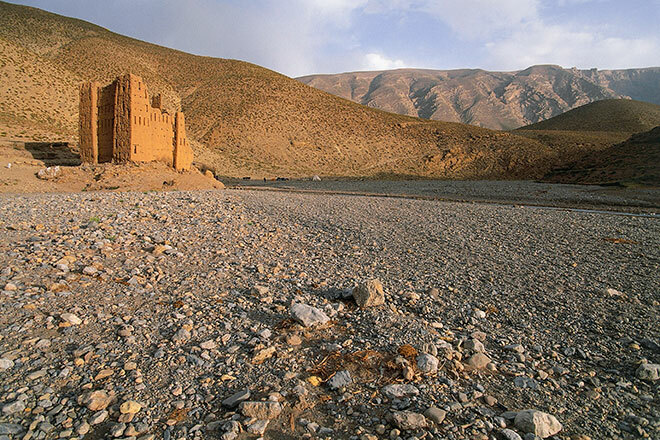 Between the High Atlas and the southern desert regions of the Sahara lies the strikingly beautiful region of Jebel Sahro, also known as Jbel Saghro, meaning the ‘dry mountain’. 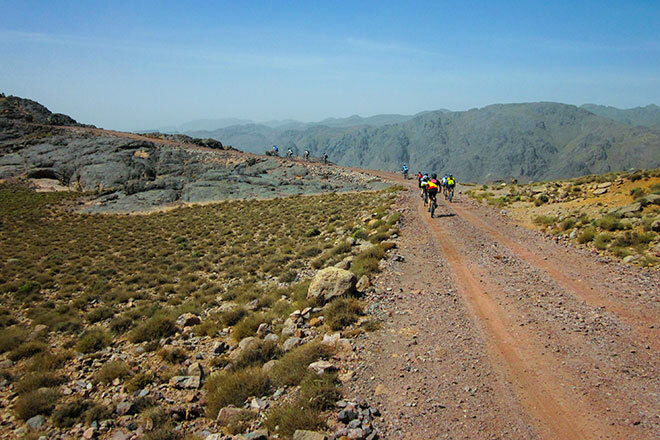 With its fascinating mix of black volcanic rocky pinnacles, lunar-like plateaux, deep gorges and abandoned kasbahs, biking in Jebel Sahro is an extraordinary experience for bikers who prefer the road less travelled. 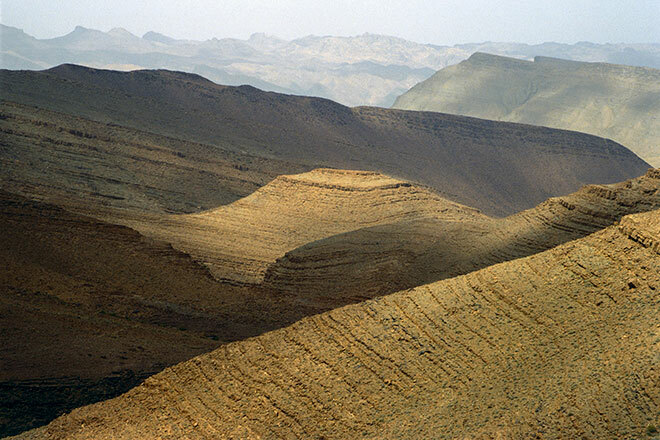 Large areas are virtually barren, with very little vegetation and no inhabitants for miles around, creating a stark and rugged beauty. 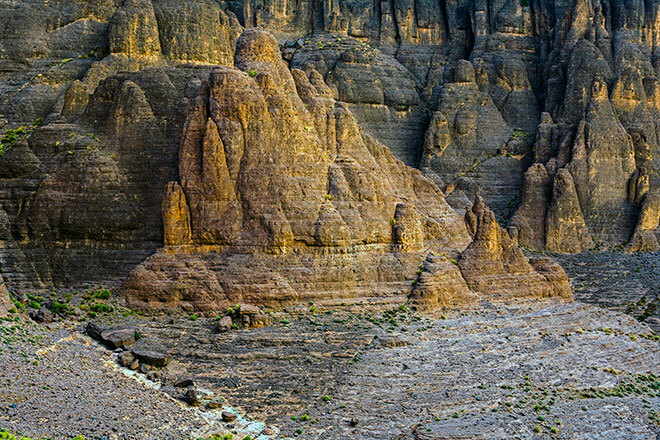 Crossing the Jebel Sahro mountain range, you wil climb the 2000 metre Tizi-n-Tazazert. 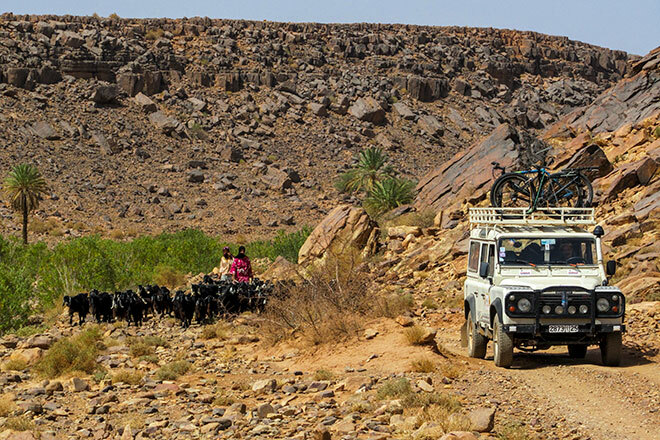 The descent winds through red table mountains, gorges and towering rocky cliffs, down to one of the most spectacular rock formations in the Sahro, the pinnacles of Bab N’Ali where you will encounter impressive rock pinnacles called Monsieur and Madame. 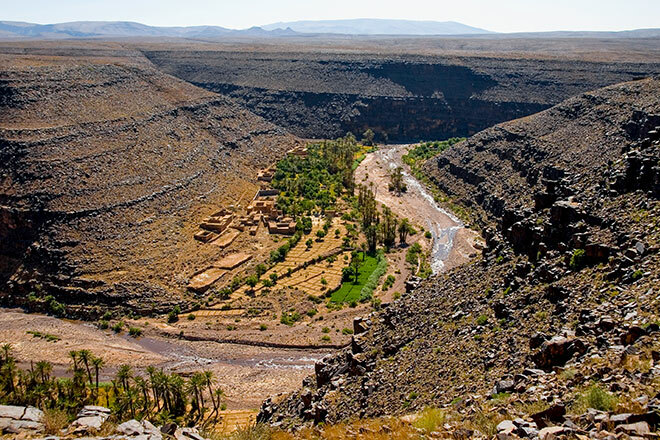 A final ride across the pitch-black lunar landscape brings you to the Berber oasis town of N’Kob, one of Morocco’s best-kept secrets. 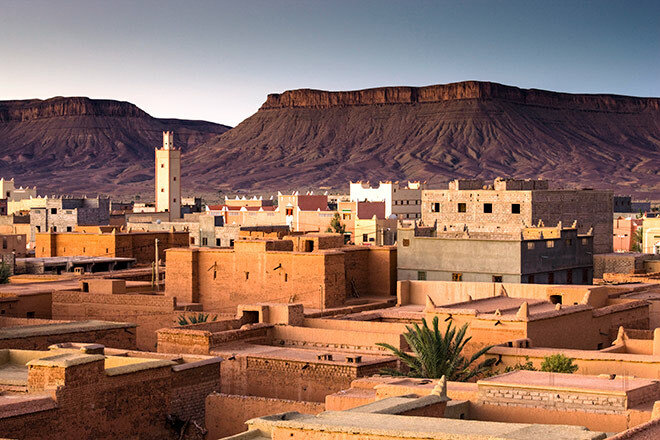 From the rooftop seats of your luxurious kasbah, you will witness a breathtaking mountain sunset. Mixed. 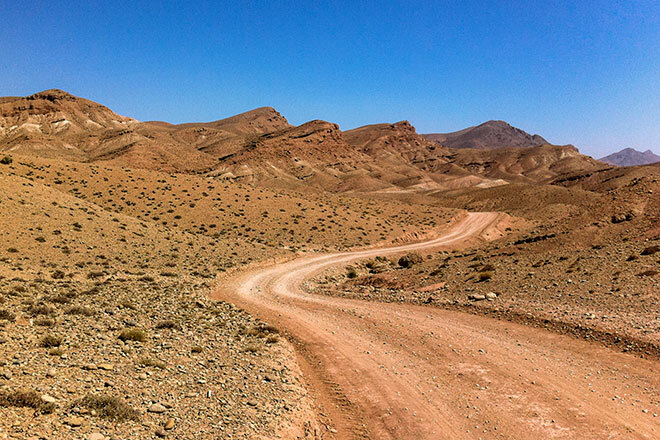 4×4 gravel trails and loose-stone paths. 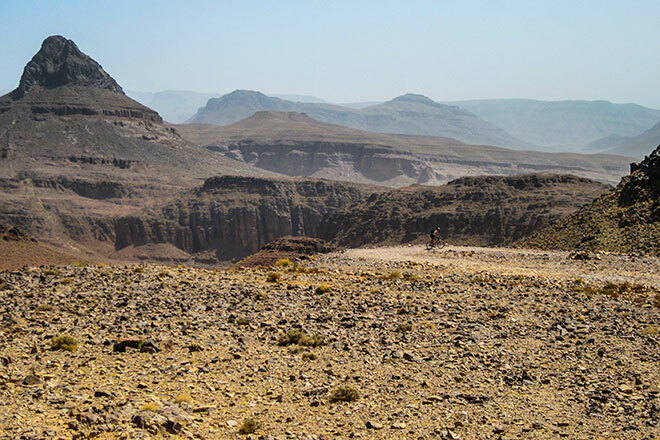 There is one technical section with a 3km rocky descent, coupled with easy-rolling canyon descents and fast packed-sand desert plateaus. 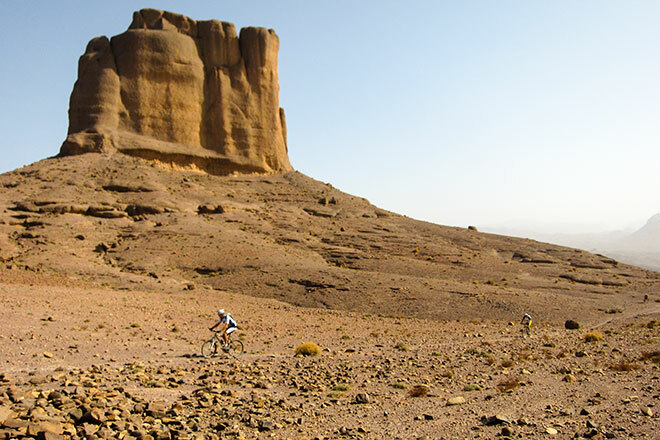 Following a bus transfer to the foot of Tizi-n-Tazazert, you will cycle 65km, with an ascent of 1000 metres. 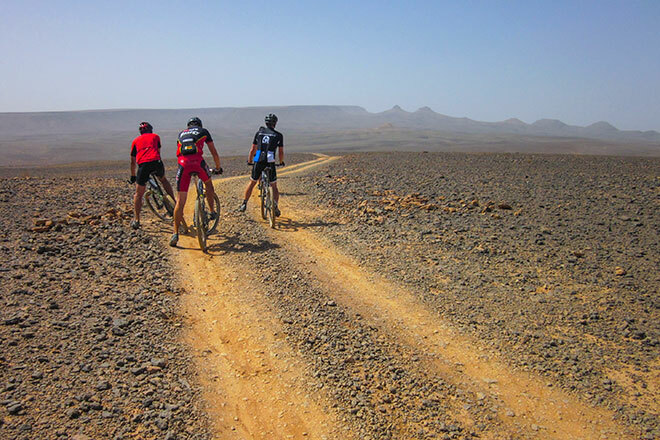 If the group’s cycling ability permits, you can opt to cycle the full stretch of 90km, with a 1300-metre ascent. 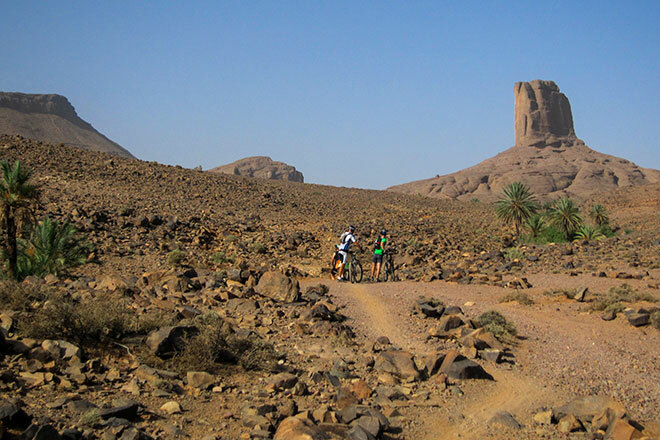 CAN YOU BIKE LIKE AN AMAZIGH WARRIOR?